Google surprised us with the long, long, long-awaited Hangouts 4.0 release earlier today, but that wasn't the only update worth paying attention to – Android Wear v1.3 turned up in the later hours, as well. 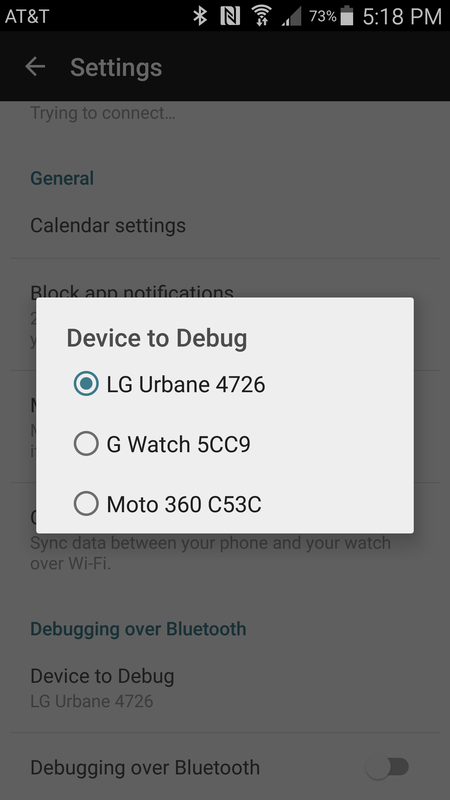 At first glance, the only new option appears to be a selector in settings for choosing between watches for hacking or programming purposes, but a teardown reveals some great new features we can expect to see in the next major firmware release to Android Wear. If you load Wear v1.3 to your phone right now, the only change you're likely to see is a new option in the Settings screen titled Device to Debug, which pops open a selector with a list of your currently paired watches. Developers can pick which watch to hook up to during a debug session over Bluetooth. 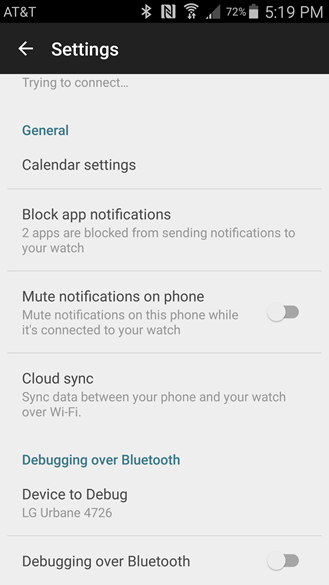 This clears up a minor oversight that was brought about when Wear was updated to support multiple paired watches on a single phone. The first two items on the list will be discussed in the next section, but let's give the other two a bit of attention right away. A pair of new built-in apps are on the way. There aren't many details, so this will go quickly. New Weather app – The changelog simply describes a weather app with a 4-day forecast. Aside from that reference, there are no strings or hints that this new app is a part of the Wear companion, so it's likely to be included with the firmware updates. Currently, weather is provided by a Google Now card with a page for current conditions and another with a 4-day forecast, but a native app might provide more extensive information and function, or it might just look better. 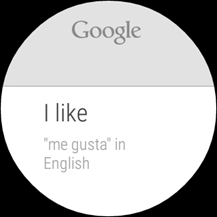 New Translate app – Another new Wear-specific app is on the way to serve Google's translation capabilities. It's not clear if the app will significantly expand on the simple response card Google currently offers with a voice search, but it will certainly have one new trick up its sleeve: auto-rotation. While most apps on Wear remain in a strict alignment so the wearer can see it when held in the correct position, the new Translate app will flip if the text is not shown right-side up. Google is adding this feature so results can be easily shown to another person by slightly turning a wearer's arm away, rather than making them twist their arm outward at an awkward angle. It's hard to explain clearly, but it makes a lot of sense if you try to make the motion. Current non-app versions of Weather and Translate, all provided by the Google app. 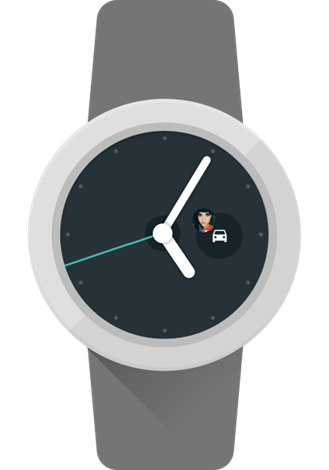 The changelog gives two names for new types of watch faces: Interactive and Together. Phandroid posted the first details about Interactive and Together faces a few weeks ago. 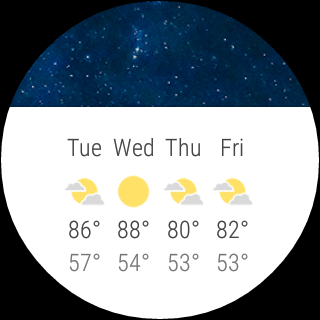 Interactive watch faces seem fairly self-explanatory – they allow users to touch the watch face without triggering the default system behavior of switching over to the list of apps. Developers can already achieve this kind of behavior, but it hasn't been officially supported in the past. Interactive watch faces could be used for simple activities like easily changing background colors on the watch face, or more involved behavior like starting a workout, sending a message, or even triggering automation with tools like Tasker. Together watch faces are the most interesting addition of this update, by far. They will allow two people to link together and communicate events through matched watch faces. Read that again and try not to think of the most nauseatingly happy couples you've ever met. You know the type: matching luggage, matching rings, maybe even matching clothes. This is definitely meant for them, or maybe the controlling and jealous types, too. Regardless of whom it's intended for, it still sounds really interesting. 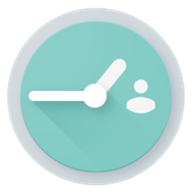 A pair of images found in the Wear apk demonstrate one idea for a simple watch face. Each picture shows a tiny profile picture next to an activity icon, indicating that the wearer of the linked watch is currently running, driving, or just standing still. However, as some of the strings seem to indicate, the possibilities are virtually endless. It looks like developers could send status messages that include just about everything from GPS coordinates, to custom text messages, to full-size photos. Imagine as the background of your watch face changes with every photo your girlfriend (or boyfriend) takes. Pairing two users together appears to be a fairly simple process, and it can be done remotely if desired. One person can send an invite in the form of a link to another, which initiates the pairing process. How the links are sent isn't specified, which indicates to me that they can be pushed through a share intent to an email, instant messenger, or even a social networking app. If you happen to be standing right next to your intended partner, there's a faster and easier method: you can... bump them. You read that right, Bump is back. For those who may be new-ish to the smartphone world, there was a company back in the "early days" called Bump (circa 2008-2013) that helped users to establish a connection between smartphones by physically bumping them together. (This was before we had things like NFC or the common sense to not smash expensive devices with fragile components against each other.) Using details like general location and the timing of an accelerometer spike, Bump could determine which two phones had been tapped together, which was then used so people could exchange contact details, photos, or other data. Google bought Bump in 2013, but the service was shut down a few months later, and the remains of the company seemingly vanished after that. There are some specific limits for Together, starting with the watch face. Judging by the text, it seems that pairing comes with the requirement that both parties use the same watch face. 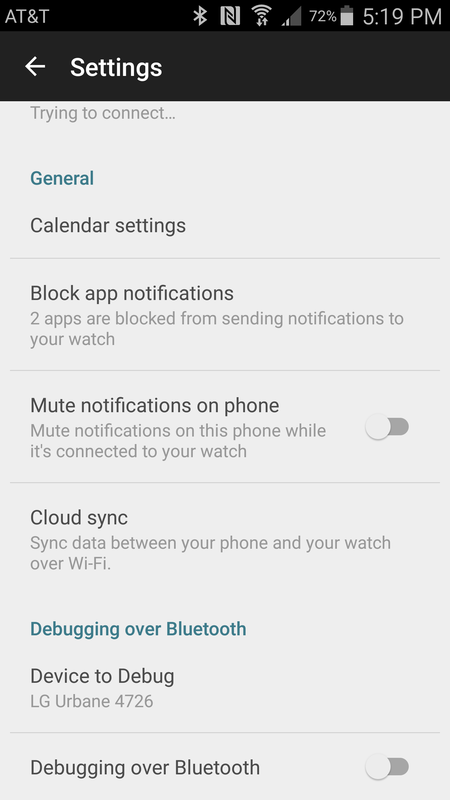 It's not clear how strictly this rule is enforced, but I expect that developers will be able to provide multiple watch faces so long as they share the same apk. Sadly, this means there won't be any concept of a common set of protocols that any watch face could consume and display in its own unique way. Maybe this will change in the future. The other catch is that pairing is a strictly two-way affair. While that makes sense for couples, it comes with the obvious flaw that Together can't be a party line. Many excellent use cases are excluded simply because they would involve more than two participants. I can imagine a family of four (mother, father, and a couple of kids) that glance at their watches to know which family members are at home, school, or work. Another good one would be a watch face that shows when friends are working out and encourages each wearer to be competitive with their friends. To be fair, a motivated developer could certainly build these things manually with Google Cloud Messaging, but that means losing out on all of the good work Google has already put into making Together. The remaining strings for Together are just below. 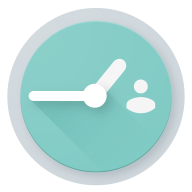 Most of them are for developers to use in the course of building a watch face, but a few of these will also show up in various interfaces and pairing screens. I get the sense that Together is a bit of a gimmick. That's not a bad thing, per se, but this is probably a response to silly gimmicks in the Apple Watch like the one that allows users to message each other with "taptic feedback" by either tapping on their watches or recording their own heart beat. <shudder> While some of these things are cliché, they can successfully give consumers a personal connection to the gadgets, which can go a long way in driving sales. The difference is that Together can actually be useful. Simple things like knowing your husband or wife is currently on a phone call will mean you know not to dial them up at that very moment. Inventive developers will find clever ways to use Together that don't stop at simple status updates and photo sharing. 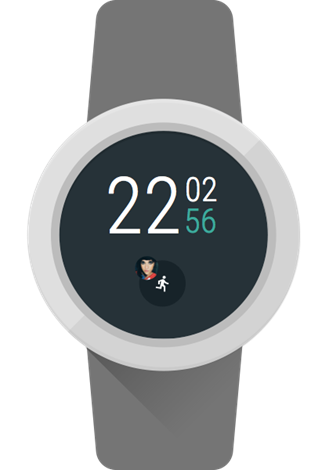 Despite a few nit-picks, I really do think Together-enabled watch faces are a pretty cool idea. To close out the list of discoveries, this new icon was added alongside the standard launcher icon. It's clearly related to Together, both for the "wc" prefix in the filename and the presence of the shadow-less head and shoulders that resembles the profile picture shown in the screens above. How and where it will be used probably isn't that interesting, but I thought some people would like to see it and discuss its finer points until it is revealed in the near future..